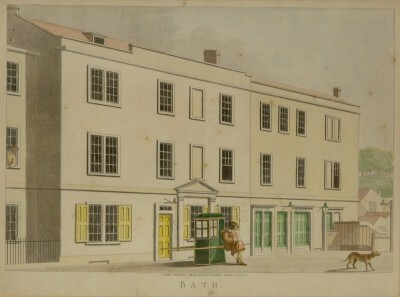 In my last blog I spoke about how the Theatre was established in Bath in the 1700s and now I’ll tell you a bit about the Theatre Royal itself. 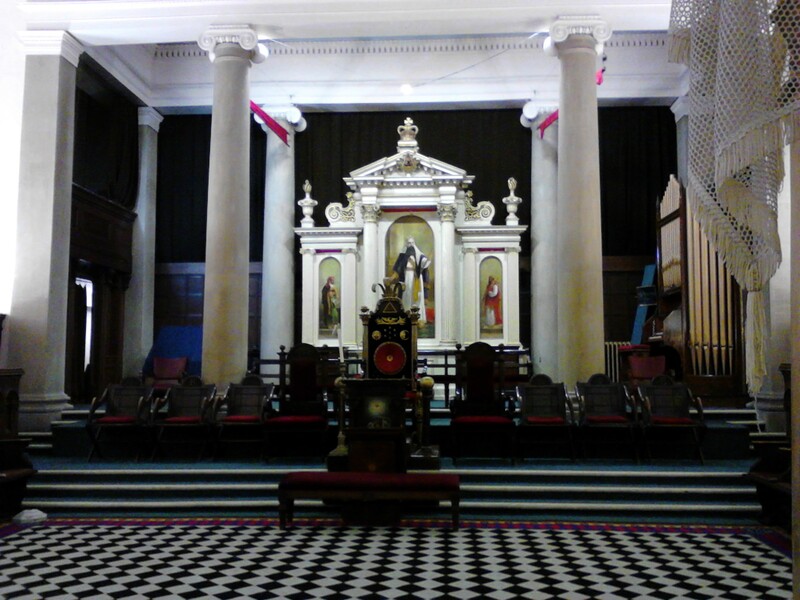 It was opened on 27th October 1750 but at the time it had no boxes. When it opened the space was simply a stage and the audience watched from a sloped floor which rose by roughly seven feet from the front of the Theatre to the back. The elite who visited Bath must have still thought the then new Theatre a bit less than genteel in comparison to the venues they frequented in London. They could not reserve a space nor escape the local less well born who might attend. But still they managed to engineer an improvement to their Theatre visit. They would send their servants to the Theatre early and have them reserve a space and then arrive once the play had commenced. Of course that meant disturbance for everyone else as people forced a path through the crowd to get in and their servants forced back through the crowd to get out. And let’s remember there were probably at least two dozen or more aristocrats or gently born patrons reserving spaces. 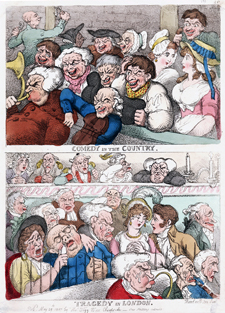 But then a Theatre excursion was very different in the 1700s and 1800s, it was quite normal for people to talk through a whole play and the servants reserving spaces in Bath were often known to shout across the hall to one another if they were bored with waiting for their employers to arrive. In London those who occupied boxes would move between them, visiting each other and socializing, and sometimes pay no mind to the play at all. In the pit and on the floor level as in Bath, the audience were known to regularly converse with the actors too, shouting things up at the stage. The courtesan’s in London hired out boxes for a season solely to hold court there. As the play progressed they entertained gentlemen visitors as it was the fashion for men to be seen with the priciest of courtesans and vie for her favours. It was the age of romance, or what the gentlemen of the era called romance, which was to pine and write poetry and say pretty words to a woman. A scene in Harriette Wilson’s Memoirs which were published in 1825 describes a Theatre excursion. Harriette was a courtesan as were two of her sisters – I wrote a blog about one of her sisters who ended up marrying a Duke previously– see Attingham family tales, Sophia Dubochet and the 2nd Lord Berwick . Anyway Harriette used to share a box with other courtesan’s in London and to earn a little extra money they would resell the seats for the box, yet people who purchased them did not have space in the box but room in the pit below. On this occasion a couple who were from the country misunderstood the purchase, took the seats in her box and would not move unaware they shared it with a courtesan. Harriette describes their growing agitation as she continued to speak with the one gentleman in her company that night. I should imagine many similar arguments occurred in Bath. But on that occasion Harriette tried to force them from the box by talking louder and laughing more and when that did not work she cleared them from it by telling them who she was and that they appeared her friends. So anyway, back to Bath. Not only would the elite in the audience arrive late they may also dip in and out of the play and only attend for a particular scene which their favorite actor or actress played in. And of course the actors and actresses were as human then as they are now and treated their late arrivals and early leavers in the same manner a comedian would treat a heckler now, welcoming them or bidding them goodbye in a range of responses dependent on their mood. There is one instance of an actor in Bath becoming thoroughly outraged with a member of his audience. The favored elite could sit on chairs at the side of stage during a performance as there were no boxes, and on this occasion the gentleman was so bored he walked across the stage to speak to his friend on the other side. Swords were drawn over the issue. Even other actors could be disrespectful of the play. When their part finished they would sit on stage, not in the wings, and an actor with an ego was known to make faces and deliberately look bored through another’s performance. Perhaps you can imagine the atmosphere in the Theatre too. There were no windows and no air vents. It would have been hot with so many people crowded in and the air would have smelt of sweat and been quite thin by the end of a performance, probably not a comfortable or pleasant experience – really it’s no wonder they only stayed for elements of a play. The Theatre was lit with tallow candles, both burning on the stage and about the auditorium which meant members of the audience had hot wax dripping on their clothes and heads. It is not surprising then that improvement commenced quite quickly, boxes were added along both edges of the Theatre, you can see on the photographs of the walls as the Theatre is today the markings in the plaster where the boxes once were. 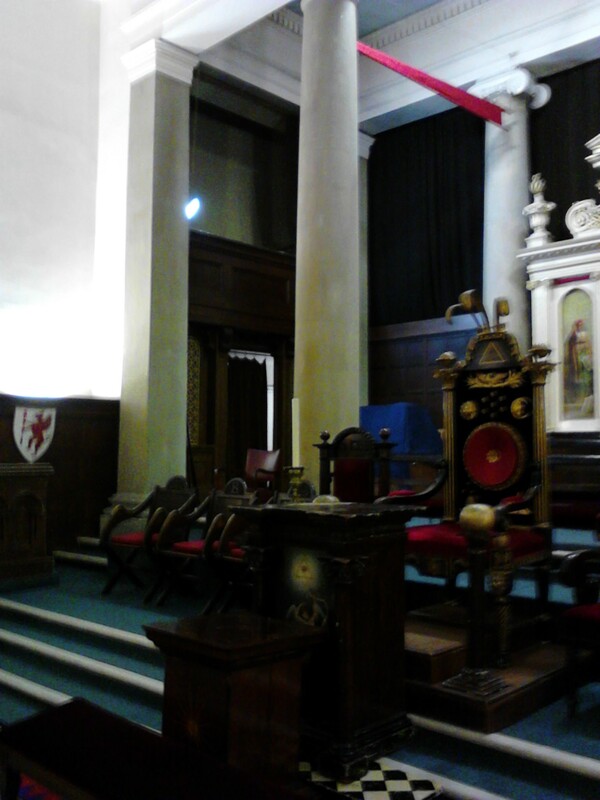 And boxes were added at the side of stage too so the chairs could be removed from the stage itself. Also a dome was placed in the middle of the ceiling and decorated with a picture of Apollo and the Muses in 1767 to add beauty and grandeur, which it did, it was described as ‘esteemed, in fancy, elegance and construction, inferior to none in Europe,’ except that it was a dreadful addition as it ruined the acoustics. It was later taken out. In 1768, once the beautifying dome had been added, the Theatre’s manager of the time, John Palmer Junior, the son of the John Palmer who helped build it, presented a petition in London for a Royal Warrant for the Theatre. It was granted by special Act of Parliament and the Orchard Street Theatre became the Theatre Royal, Bath. It was the first provincial theatre to receive the accolade, prior to this only Drury Lane and Covent Garden held the honor. Then in 1774 an entrance lobby was added on the front of the building and a crush room serving refreshment, and above this seven more grand boxes facing the stage, there are no signs of these now. The boxes stretched back in a fan shape and had five rows of benches, seating five occupants on each bench. It cost three shillings for a box seat and two shillings for the pit. The other addition was a carriage forecourt in which the elite might be deposited at the door easily without needing to walk through the street. The steps down to the carriage forecourt can be seen at the far right of the picture of the exterior by Woodfall. We know Jane Austen definitely visited the Theatre Royal and occupied one of the boxes on a visit to Bath, but more about this in my next blog. Posted on July 22, 2012 by janelark •	This entry was posted in Georgian Stories, Jane Austen, Stories from the City of Bath, Stories of Kings and Queens and tagged 1700s, 17th Century, 1800s, 18th Century, Bath, georgian, Historic Houses, history, Jane Austen, Jane Lark, regency, regency books, writing. Bookmark the permalink. ← I discovered a real gem to add to my blogs on Bath yesterday – the old Royal Theatre, Orchard Street, Bath – Jane Austen was certainly a visitor there.